Could an X-wing aircraft from Star Wars actually fly? 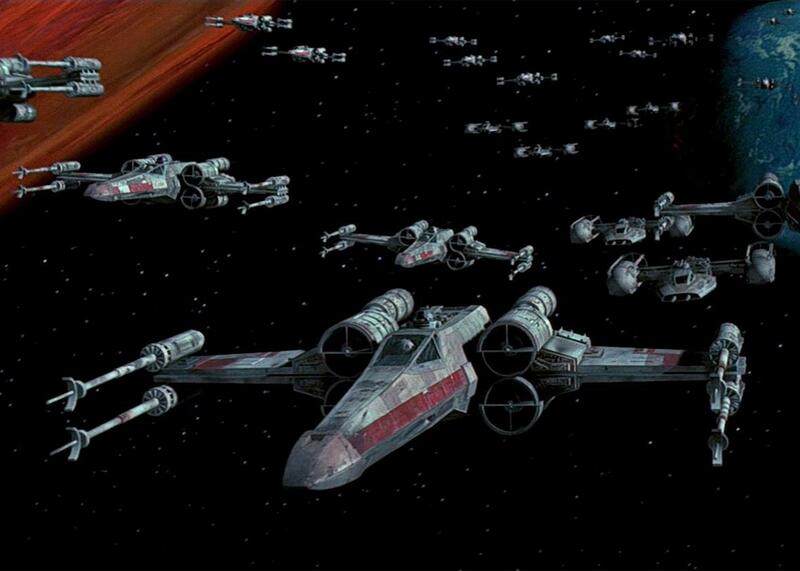 X-Wing Squadron in Star Wars. First, let’s assume you mean the X-wing fighter from Star Wars could fly here on Earth in our atmosphere. Anything can fly in space in zero gravity with the right propulsion on it—even a brick. This basic design could fly. It’s similar to a blended-wing body style plane, just with a big nose. With modern computer control, it could be easily controlled. If we didn’t have those controls, it would likely be extremely difficult to fly, as it is not a naturally stable configuration without a tail or forward-lifting surfaces. A naturally stable plane has is its aerodynamic center of pressure behind its center of gravity, so any deviation from straight flight tends to straighten out the trajectory. There are some military fighters and blended-wing bodies that have their center of gravity aft of the center of pressure and are therefore unstable, and they require fast computers to keep them flying straight, but they fly well and are very maneuverable. No vertical stabilizers (fins) are required; computers can yaw the craft with differential drag and ailerons, and this has been proven in a number of stealth craft. The X-wing fighter, though, is not a very aerodynamic design. All those intersections at the fuselage will create a ton of drag due to interfering aerodynamics. The engines and wingtip pylons are not helping in that regard, either, as they are not well blended in. The wings are essentially a biplane configuration, which definitely works. The designer would need to take extra care near the fuselage due to the surfaces being so close together; their wakes would interfere with each other. Careful tuning could help turn this into somewhat of an advantage in slow flight. The square wing cross-section and all that hardware sticking out of the wing surfaces would need to get fixed to reduce drag but would work as-is. A flat airfoil can create lift at a non-zero angle of attack; it does not need to be a shaped foil. Flat surface lift is an into aerodynamics problem—even a pizza box can fly as a wing given the right propulsion and controls. Aerospace industry: Why has the speed of commercial airliners remained more or less a constant over the years? Star Wars: How do Han Solo and Chewbacca understand each other? Aircraft design: Are there engineering reasons why airplane cabins aren’t wider?